Add this shop to my favorites. Africa from the best Authorities - Kitchin c. Availability: in stock Condition : Very good, general age-related toning. 1770 Overall size : 20.5 x 17.5 cm. Image size : 19 x 15 cm. 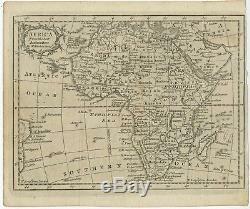 Description: Antique map Africa titled'Africa from the best Authorities'. Detailed, small antique map of Africa. Originates from'The Modern Gazetteer.. Artists and Engravers: Thomas Kitchin or Thomas Kitchen (1718 - 1784) was an English engraver and cartographer, who became hydrographer to the king. He was also an author, who wrote about the history of the West Indies. The item "Africa from the best Authorities Kitchin (c. 1770)" is in sale since Wednesday, October 31, 2018. This item is in the category "Antiques\Maps, Atlases & Globes\Africa Maps". Format: 20.5 x 17.5 cm.